His Grace the Right Reverend Bishop Nicholas (Ono) of Japan was consecrated as the ruling bishop of the Church of Japan in 1941 when the militaristic Japanese government required the heads of all religious groups in Japan to be Japanese nationals. 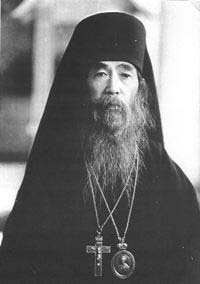 He was the first Japanese national to be consecrated an Orthodox bishop. The future Bp. Nicholas was born Kiichi Yamazaki on September 8, 1872, in the village of Kannami in Shizuoka Prefecture. When he was still in elementary school, his older brother, Yamazaki Kenzaburō, was baptized into the Orthodox faith under the name of Sabbas and became a catechist. As young Kiichi finished his education at school, he hoped to continue learning and went to Tokyo where he was introduced to Archbishop Nicholas (Kasatkin) and entered the Orthodox Seminary in Tokyo, being baptized under the name of John in 1885. John completed his education in 1892 and became a catechist, following in the footsteps of his older brother. In 1894 he married Vera (Faith) Ono accepting her family name. His wife, Vera Shin, was the daughter of Fr. John Atsure Sakai, the first Japanese ordained an Orthodox priest. On March 19, 1905, with Abp. Nicholas officiating, he was ordained to priesthood and was assigned to be the priest of the church in Takasaki where he spent over thirty years, acquiring a rich pastoral experience. Suddenly, as the wartime pressures on the Orthodox Church in Japan were mounting, he was reassigned in 1939 to the Yokohama Orthodox Church. When in 1939 the increasingly nationalistic Japanese government passed a law requiring government authorization of all religious bodies in Japan for them to be legal. The government implementation of the law included the requirement that religious groups must be headed by Japanese nationals. In this Metr. Sergius, who was the Archbishop of Tokyo and Metropolitan of All Japan, and the governing bodies of the Japanese Orthodox Church faced a grave predicament that resulted in a split among the church authorities into two groups on how this would be accomplished. In early 1941, one group (Iwasawa) appeared set on a course wherein the registered head, the Tori, would be a layman. This approach apparently was based on the model familiar to those educated in Russia before the revolution; that is, of church governance headed by a layman, the Ober-Procurator named by the Emperor. Dissatisfaction with this course led to a second (anti-Iwasawa) group that elected Archpriest James Shintaro Tohei as the episcopal candidate and Tori. In the meantime the Iwasawa group had approached the Russian Orthodox Church Outside Russia (ROCOR) for consecration of a bishop. Archpriest John Ono was elected as the Japanese candidate to episcopacy. Fr. John was then the oldest priest in the Church of Japan. As he was married, he and his wife traveled to different monasteries in Harbin, Manchuria, which at the time was ruled by Japan. In Harbin, Fr. John was tonsured a monk under the name of Nicholas and his wife Vera was tonsured a nun with the name Helen. On April 6, 1941, Fr. John was consecrated the Bishop of Tokyo and All Japan in St. Nicholas Cathedral in Harbin by the hierarchs of the ROCOR: Metr. Meletius (Zaborovsky) of Harbin and All Manchuria, Abp. Nestor (Anisimov) of Kamchatka and Petropavlovsk, Bp. Juvenal of Qiqihar, Bp. Demetrius of Hailar and Bp. John (Maksimovich) of Shanghai. (Some sources name Abp. Victor (Svyatin) of Beijing instead of Bp. John.) Thus, Bp. Nicholas became the first Japanese national to be consecrated an Orthodox bishop. After the end of World War II, the jurisdiction over most of the communities of the Japanese Orthodox Church was assumed by the American Metropolia, the predecessor of the OCA, while a minority, under the leadership of Bp. Nicholas aligned itself with the Moscow Patriarchate. On May 27, 1954, Bp. Nicholas was reconciled with the Japanese Orthodox Church, then led by Bp. Ireney (Bekish). Bp. Nicholas died at the age of 83 on November 19, 1956. He is buried in Yanaka Cemetery in Tokyo, alongside his predecessors: St. Nicholas, the Enlightener of Japan, and Metr. Sergius. Ushimaru, Proclus (Yasuo), Priest, Kami no Mimune ni Ikita Gekidō no Shimobetachi, Tokyo, Office of the Metropolitan, the Japanese Orthodox Church, 1985. This page was last edited on March 17, 2012, at 13:40. This page has been accessed 27,537 times.